ACCOMODATION Tents - 2 nights, 2 Night Private House. 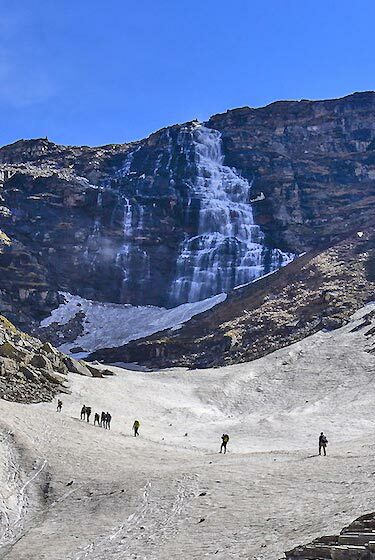 The Kuari pass trek, also referred to as the Lord Curzon trail trek, is surely one of the most popular and finest treks in the Indian Himalayas and rightly so. According to us only thing missing on this trail was the ‘adventure element’ so we modified the regular itinerary a bit and added an exciting stage to this trek where you get to climb a challenging but doable Himalayan peak called Pangarchulla (4700 m). 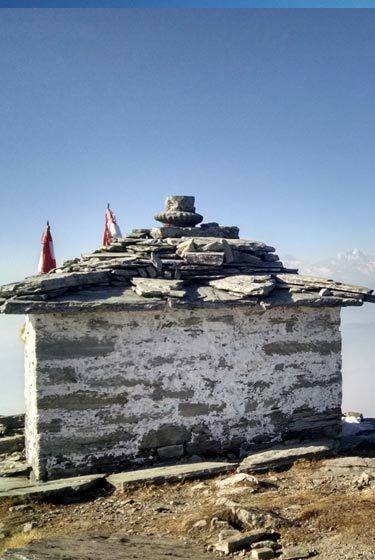 This peak can be climbed by ‘fit’ first time trekkers also but with some hard work put into it. Pangarchulla peak poses challenges which keep on changing with seasons. Beginning of the season (Apr – May) the climb involves navigating through deep snow while later in the season (Oct – Nov) difficulty comes in the form of bouldering and traversing scree slopes. Our guides will run a small course on climbing techniques to get you to know more about the sport and get comfortable with it. They will put ropes for safety (if required) and will assist people throughout the climb. One is not required to have any prior climbing experience/knowledge. DAY 01: Haridwar - Auli (2450m) Drive/280Kms/8-9 Hrs. We will meet at Haridwar railway station at 7 a.m and from here board a vehicle and be driven up to Auli. This is a long but interesting drive. You will for most part of the journey drive along the Ganga & Alaknanda rivers. 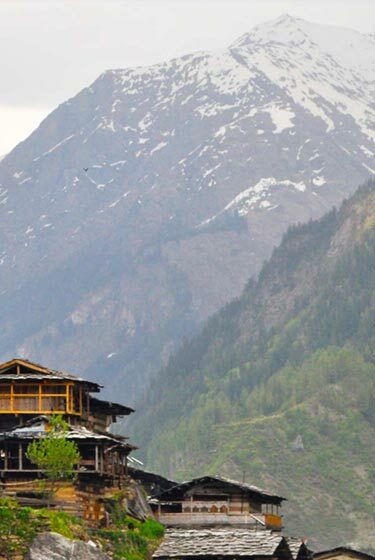 Enroute you will be crossing the holy towns of Devprayag & Rudraprayag. Evening relax at the beautiful lodge. Overnight in the lodge in Auli. about a couple of hours reach the magnificent campsite at Khulara where we camp for the night. It’s a beautiful open meadow where you camp and get very good views of the big wall of mountains in front. If it’s a clear night star gazing is going to be fun. Overnight in tents. DAY 03: Khulara – Kuari Pass (3650m) Base of Pangarchula Peak Trek/6-7Hrs. Today we go through a series of ascents on meadows which keep on getting better as we move up. Walking on golden, green and other hues of grass is just bliss. The mountain air is crisp and the views brilliant! You are sure to catch a shepherd with the sheep and the dog. Do spend some time with them. The views are going to be great throughout so we keep our cameras handy. We will reach Kuari pass in about 3 hours or so. Our guide might give you the option of not going to the actual pass (which is nearby) and instead climb another vantage point with better views so take a call depending upon what you feel like doing. After spending sometime at the vantage ridge/Kuari pass we will start walking towards our base camp for the climb to Pangarchula peak. 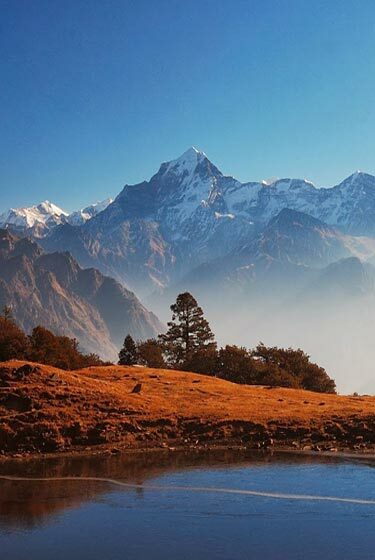 Today you will get to view many big and renowned Himalayan peaks like Chaukhamba, Kedarnath, Neelkanth, Haathi-Ghodi, Kamet, Mana, Dronagiri, etc. Overnight in tents. DAY 04: Base Camp 3650m – Summit Pangarchula Peak 4700m Trek/7-8Hrs. We will wake up early (depending upon the conditions and the season, the lead guide will take a call on what time we start but usually it will be 5:00 a.m) and after a quick breakfast start climbing up the slopes of the mountain to reach a ridge which will lead us to the top. The climb is demanding but not technical in nature. You will in patches be walking on uneven terrain of boulders, scree and rocks. Early season we will have to negotiate through deep snow that’s why we recommend an early start as it is easier to walk on hard snow. But the effort is going to be rewarded manifold with views which are surely unparalleled. Views around dawn are the best which is why we insist on an early start today. From the route leading to the summit and the top you get to see a set of big mountains which you otherwise don’t get to see from Kuari pass region, mountains like Nanda Devi, Trishul, Changbhang and many more. 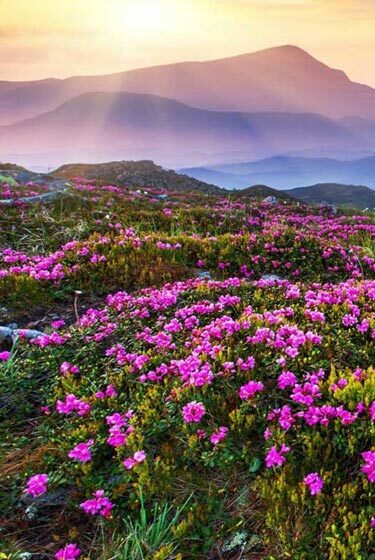 Also very attractive is the views of the surrounding valleys in all directions. After capturing the views in our camera we start walking down to the base camp. Once at the camp we celebrate our success and relax. Depending on what time we get to the base camp we might also decide to walk down to Khulara so that we reach Auli early tomorrow and get time to sort out our luggage and relax in the comforts of the beautiful lodge. Overnight in tents. After a leisurely breakfast we start climbing down towards the road linking Joshimath to Niti-Malari valley. We will walk all the way down to Dhak a small market place on this road. Walk today is again a completely enjoyable experience with us walking through interesting forest sections and couple of scenically located villages. We will make short stops at Tugasi & Karchi village and spend time interacting with people and getting to know more about their way of life. From Dhak we will board the waiting vehicles and drive to Auli where a hot shower followed by a sumptuous meal awaits us. Overnight at the lodge. After breakfast drive down to Haridwar. Trip ends here.